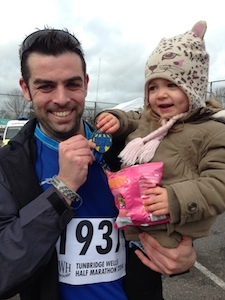 Back in September 2013, I chose to do the 2014 Tunbridge Wells Half Marathon, as I needed a new challenge. I’ve ran a few events before but this one excited me and it didn’t disappoint. Its a fantastic course with many different challenges along the way, but finishing in 2 hours, 4 minutes was by far one of the best moments I’ve felt in along time. I chose to run for the M.A. on March 2 2014, as I’ve been affected personally by miscarriages in so many ways in recent years. On 01/11/2010 my former partner miscarriaged and I can’t begin to explain how distraught we were, its a pain that hasn’t gone away over the years (we named him James Patrick Iles). My sister also had a miscarriage shortly after we lost James which was extremely tough on my family and our friends. We have both since been extremely fortunate to have our own children, Leo (my sister’s son born 4 months premature and now approx. 18 months old, a true miracle!!) and Lottie (my daughter, approx 30 months, pictured), where I’m sure that many haven’t been able to. I’ve also had many friends suffer in the same circumstances in recent times, which made deciding to raise money for the M.A. as no brainer. All they work is just amazing, I can’t thank them enough! This 13 mile course is dedicated to James Patrick Iles, gone but never forgotten! You’ll always be our boy!